We have just completed a national tour of 'Tinned Goods' receiving excellent responses from audiences and reviewers alike. 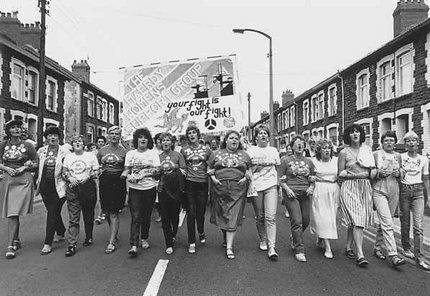 'Tinned Goods' is set during the miners' strike of 1984/5 and features a cast of women playing multiple roles. Sue and Rachel have not spoken since the miners walked out three months earlier. With their friendship suffering from the strain of politics, picket lines and principles, forgotten wrongs resurface and loyalties are pushed to the limit. In this tight-knit town, as the miners' wives move from the background to centre stage, can the women find a voice in a battle to save their relationships and their way of life? 'Tinned Goods' is booking now for Spring shows. "An excellent show. Queue for returns"
"Really great, powerful & thought provoking"
"You were fantastic. Moving and relevant. Thanks"
"Absolutely loved #TinnedGoods tonight, massive congratulations to Tea and tenacity for an amazing play, made me laugh and cry, which are always indicators of a proper good show"
"Absolutely fabulous performance highly recommend"
"The actors were outstanding which allowed me to understand what life was really like at that time"
"It showed a side to the miner's strike which didn't get broadcast unless you were there you wouldn't have seen the daily struggles that the families faced." "Reminiscent of the best agit-prop plays of the 70s and 80s, which fitted the subject matter perfectly. Really liked the singing between scenes, the characters impersonating others and the demonstration scene was superb. - skilfully paced and played." "The energy, the constant singing, acting, movement, the relaxed feeling and tight ensemble. Just loved it, really impressive production. Look forward to seeing what you do next!" "It was a powerful story that drew you in, you felt like you were in the lounge of these women's houses. Superbly acted and a great amount of humour mixed with serious and powerful undertones."